On this page I have placed various book-related curiosities for those of you who want to know more. Go ahead. Scroll down and look at them. Look at them, with your eyes. Scroll until your fingers bleed. 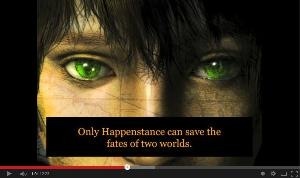 Watch YouTube videos: An introduction to my first eight books, and a book trailer for The End of Time (The Books of Umber 3). I had a geography in my head for where my first five fairy-tale inspired novels took place, and drew this map. 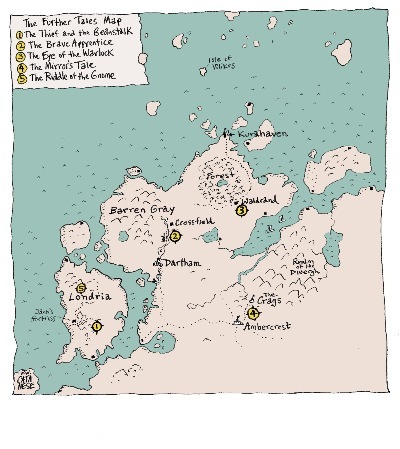 I used that same world for The Books of Umber, so many of these place names are referenced in that trilogy. You can spot Umber’s home city of Kurahaven here as well. 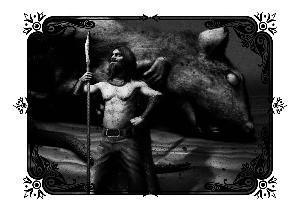 David Ho did the covers for the U.S. version of Umber and also these smaller black and white illustrations. These are some of my favorites. This book has had three different covers so far. The blue cover is the rarest one, created especially for Scholastic Book Clubs. I like to draw, and sometimes will sketch characters, scenes and maps as I'm writing. (I don't draw the book covers; we leave that to the professional illustrators.) Please don't consider these the "definitive" illustrations. Sometimes I don't think I get them quite right, even though I imagined these things. If you've read the books, then the pictures in your head are just as good. 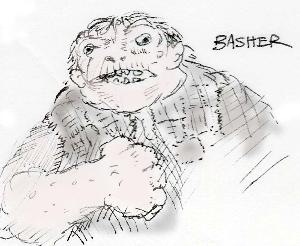 From The Thief and the Beanstalk: Basher. His brother had the brains, but Basher had the brawn. 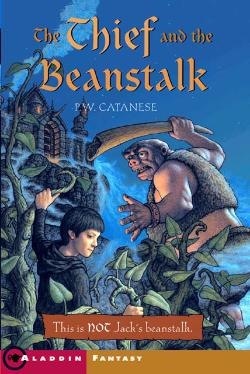 From The Thief and the Beanstalk: The beanstalk. My life as an author began when I sat down and wrote this scene on a whim. 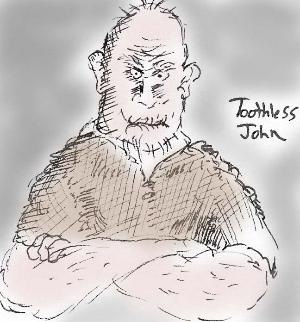 Toothless John from The Thief and the Beanstalk. 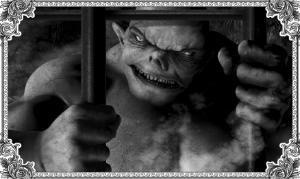 For anyone who wondered about his fate - he popped up again in The Riddle of the Gnome. 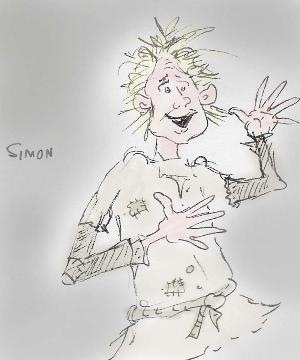 Simon from The Brave Apprentice. He was such a fun character. 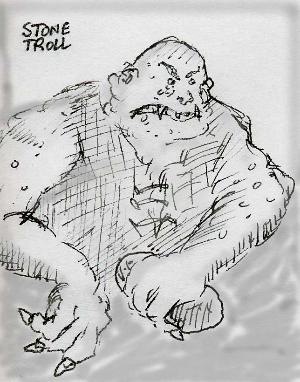 A troll from The Brave Apprentice. 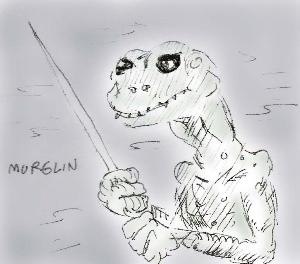 A murglin from The Eye of the Warlock. You get a glimpse of the whole life cycle of these creatures during the book. Murglins on a boat. This was an eerie setting in the swampy lair of the villain. Wow, you’ve scrolled a long way down. Are your fingers bleeding yet? Think of the following as "lost prequel chapters" of The Books of Umber. Sort of like the deleted scenes on DVDs. As you may already know, there are subtle connections between The Books of Umber and my previous five novels: The Thief and the Beanstalk, The Brave Apprentice, The Eye of the Warlock, The Mirror’s Tale, and The Riddle of the Gnome. You don’t need to read those earlier books before The Books of Umber, but if you do read them before (or after), you'll have fun spotting familiar names, places and creatures... like Bertram, spider-headed creatures and Moltons. What I’ve written here are little moments that will illuminate some of those connections. And by the way, if you haven’t completed The Books of Umber trilogy, have no fear – no spoilers lurk in these passages. Oates had only a few coils left around his arm when the rope finally went slack. Anderlin and Maud, the couple who lived in the house that concealed the cavern and had to be convinced to allow this expedition, crept close to the edge and looked down. 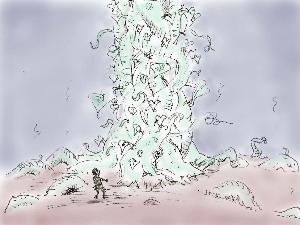 Only the dim glow of Umber’s jar of glimmer-worms could be seen from there, like a star glimpsed through a misty night. Far below, Umber untied the rope from his harness, grinning widely. As he held the lamp out and turned in a circle, something crunched under his feet. He knelt and looked closer. The floor was littered with hundreds of dead insects, like crickets, nothing now but papery white shells. The ones he’d stepped on had turned to dust. “Nippers,” Umber said. He was in the right place, according to the story he’d been told by that interesting young man with the red hair. An object glittered a few feet away. He held the lamp out and saw a battered crown, studded with jewels. He picked it up and turned it in his hands, letting out a low whistle and a chuckle. That was unexpected. He didn’t like pillaging from historic places, but this scene hardly fit into that category. A thought occurred: He would give it to those nice people who’d allowed him into the cavern. What he had expected, he found a moment later. He’d come for this, all the way to Londria. The body was small, maybe three feet from head to toe. But he knew it was not the body of a child. It was awkwardly composed, with arms and legs bent in unnatural angles. 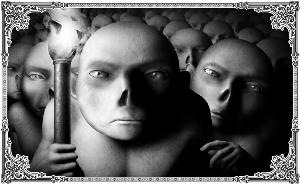 The flesh was mostly gone, gnawed away, leaving only the grinning skull. The remains of a filthy, scraggly gray beard were scattered nearby. Umber looked back up, into the darkness. The wall of rock that he’d descended was sheer; this little fellow would have tumbled all the way down, hitting nothing but air before striking bottom. “A long way to fall. Too much time to think,” Umber muttered. He put his hand on his heart and bowed his head for a moment. By all accounts, this was a dastardly villain that lay at his feet, but he never wished death upon anything. 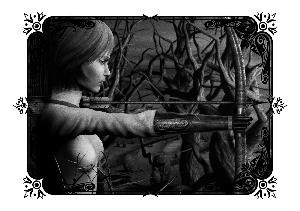 “Patience, please!” Umber shouted back. His voice ricocheted off the walls of the chasm. He took a pad and pencil from his vest and began to sketch the scene. “With my own eyes at last,” he said. He would have preferred a live specimen, but those were hard to find. Gnomes were notoriously secretive, and usually unpleasant. When he was done sketching, he put the crown in his pack and the pad back in his vest. He did a quick search of the gnome’s pockets, but found nothing. He stood and wiped his hands on his trousers. Umber yawned, stretched and scratched his belly. He was just about to blow out the candle by his bed when he heard scratching at the window. He opened the shutter a crack to peer out and saw, clinging to the wall, a familiar sight: A small, feminine head mounted on seven jointed legs. “Arabell,” Umber said. “What a surprise. And you look so lovely tonight – is that a new ribbon in your hair?” The spidery creature cooed back at him. Her crooked smile revealed a row of tiny baby teeth and a pair of sharp fangs. The Silkship floated a few feet above the Aerie’s terrace, moored by spider threads. The other spider-folk, Gossilen and Quellin, scuttled up and down the lines, making them fast. Pilot had already disembarked and helped himself to an apple from the tree of many fruits. Umber gave him a wave, and Pilot nodded in return. Pilot nodded and waited for Umber to go on. He tended not to speak unless it was absolutely necessary. Umber described his plan: a flight across the Rulian Sea, to search for a dangerous warlock who’d gone missing and might have relocated to a different island. “I don’t know what other ventures you’ve been up to, but you haven’t seen anything else unusual along the way, have you?” Umber asked. “Nothing that would interest you,” Pilot replied. Arabell climbed up his leg and back, and perched on his shoulder. Umber stared up at Pilot. He was certain the Cloud Island existed. But the people who could help him the most wouldn’t talk about it. 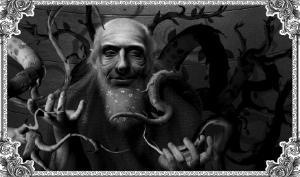 Not that wealthy old recluse in Londria, Old Man Jack, who’d been there himself, if the stories could be believed. And not Pilot. The more Umber thought about it, the more he was sure that Pilot had some important, intimate connection to that fabled place. Questions danced on the tip of his tongue: You’ve been there, haven’t you? In fact, I think you came from there. And the secrets to your flying ship come from there as well. And those spidery things you use for your crew – is that where they come from? He ached to ask all those questions, but could not, because he knew they might break the fragile bond between him and his mysterious but wonderfully useful friend.